For the best quality Colorbond fencing Melbourne customers trust, GK Roofing can help. We have a great selection of products to choose from to help you create the sturdiest fence available, and with a great selection of colours to choose from it’s easy to match your choice to your home’s décor and style. Tested in some of the harshest climates in Australia, Colorbond steel is known to be a reliable choice that will look great for years to come. This makes it a great investment for property owners across the country as they can be sure it will last. 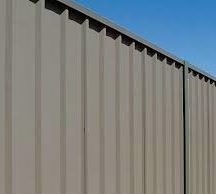 GK Roofing has over 11 years’ experience in dealing with Melbourne’s unpredictable weather, so we know that Colorbond fencing in Melbourne is a must for many homes. Our skilled and professional team are here to help you find the right solution. Browse our great selection of Colorbond fencing supplies in Melbourne below.